We hope that each of you have the opportunity to spend time at this exciting event, not only to support the club, but because it truly is an fantastic experience that we're privileged to be a part of. 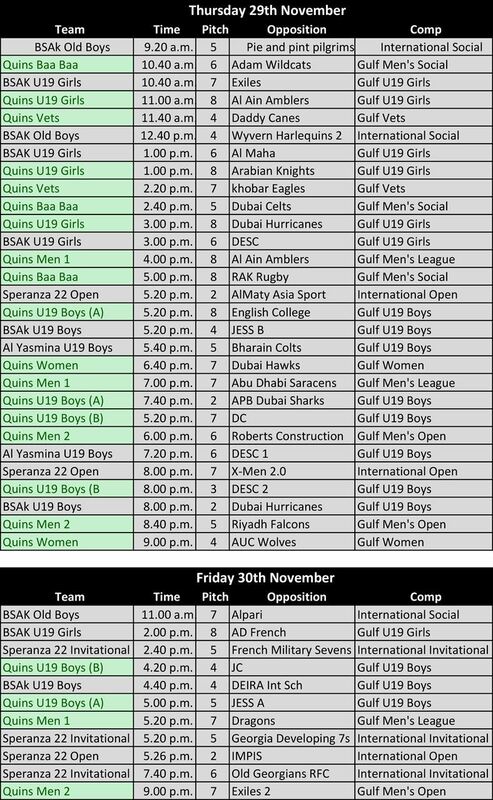 All of the pool fixtures can be found below, and on our website at www.abudhabiquins.com/dubaisevens2018. We will try to get the scores and the details of matches after the pool stages updated on that page, but also at www.facebook.com/abudhabiquins. If you want to come along and find us at the tournament then we'll try and set up on the side of Pitch 2, next to Costa. If you're spending more than one day at the tournament then Quins have a very good rate at the Premier Inn, Investment Park. Click here for more details. Finally, don't forget your water and sun-cream and be sure to enjoy yourselves!